This pattern is in honor of our furry friends. Wool & Co. loves animals & every time a customer skips a bag in store we donate $.25 to Anderson Animal Shelter. With your help we have donated over $1,100 to the shelter! 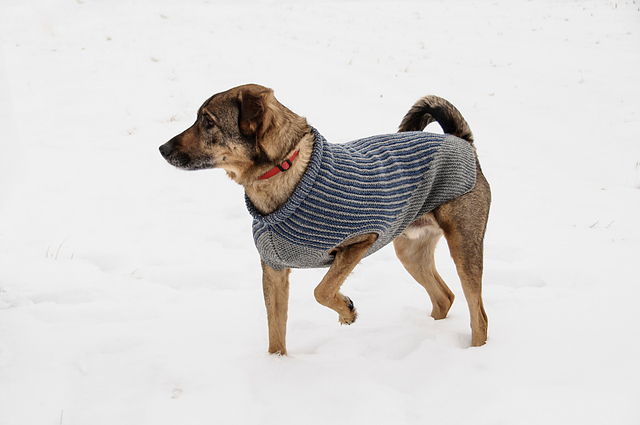 The Bird Island Dog Sweater by Sys Fredens will keep poochie warm & cozy all winter long. Start now for a holiday surprise. 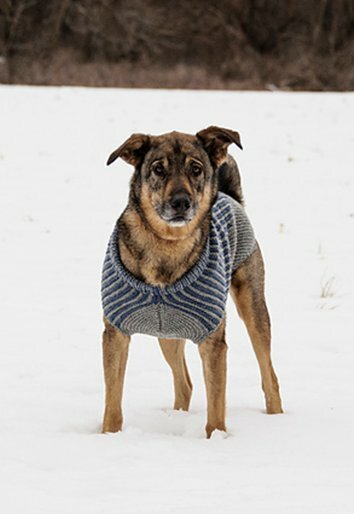 The pattern includes five canine friendly sizes & is knit in one piece. The model above includes two colors of Blue Sky Fibers Woolstok worsted weight yarn graphically striped using the intarsia method. The sweater could also be knit in one color if desired. Materials required include 2-5 skeins of Woolstok 50g (depends on size chosen), size US 8, 24” circular needles & double point needles.